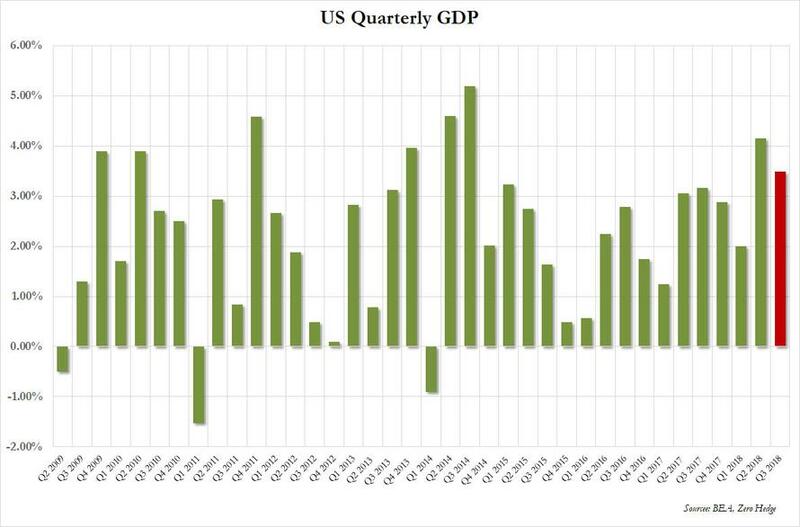 With the US economy firing on all four cylinders heading into the 3rd quarter, largely thanks to the latent effects from Trump's fiscal stimulus, moments ago the BEA reported that in its first estimate of Q3 GDP, the US economy continued to surprise to the upside, growing at an annualized rate of 3.5%, modestly below the second quarter's 4.2% print but above the 3.3% expected. However, a quick look at the internals reveals some ugly details below the surface. While Personal consumption was indeed strong, rising 4.0% in Q3 after 3.8% in Q2, the largest increase since Q4 2014, and contributing 2.69% of the bottom line 3.49% GDP print, the main reason why the US economy grew as fast as it did in the third quarter was a build up in inventories, which contributed 2.07%, or 59% of the bottom line number. 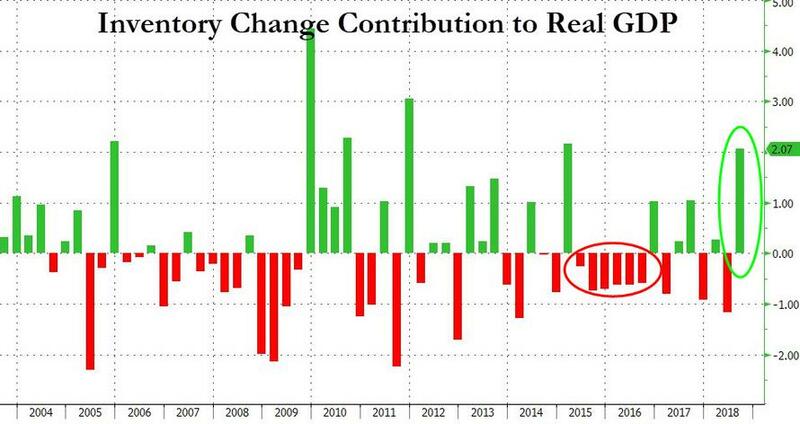 This was the biggest quarterly inventory stocking since the first quarter of 2015. 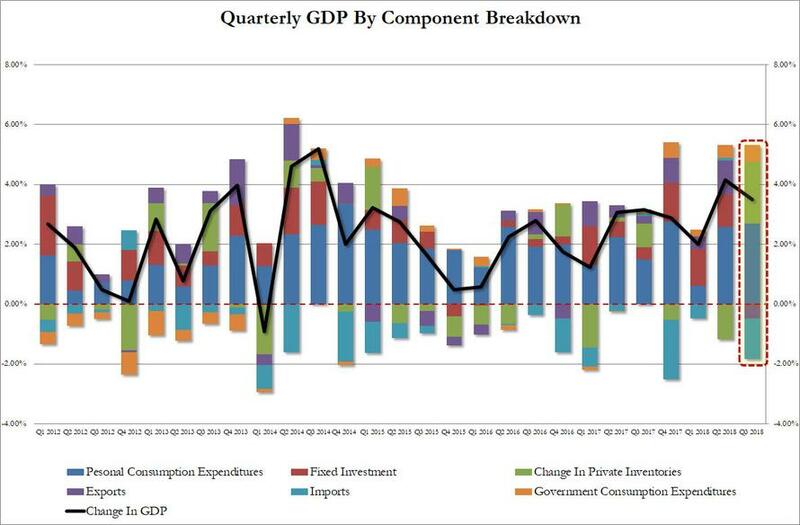 All the other components of GDP were ugly, with nonresidential fixed investment, or spending on equipment, structures and intellectual property collapsing to just 0.8% in 3Q after rising a blistering 8.7% in the prior quarter. Commenting on this drop, CIBC economist Royce Mendes noes that "business fixed investment showed up only flat on the quarter, possibly a sign that the most potent effects of the tax cuts are now in the rearview mirror." In other words, between CapEx and Net Trade, the US economy actually contracted by over 1.83%. The final offset was government consumption which added 0.56% in Q3, resulting in the following breakdown. "The composition of growth in the third quarter has some important implications. The economy has reverted back to the `same old' model of consumers accounting for most of the growth. Supply-siders will be disappointed to see business fixed investment essentially stalling out after a robust first half. As a result, the implication is that the surge in growth is not the onset of the economy evolving toward a new speed limit; rather, the frothiness in the second and third quarters really does appear to be largely due to a sugar high from tax cuts. Unfortunately this is not sustainable barring tax cuts 2.0." Other details from today's GDP report showed that the economy may have indeed peaked, with core PCE rising just 1.6% in 3Q after rising 2.1% prior quarter, missing expectations of a 1.8% print. The GDP price index also missed, rising just 1.7% in 3Q after rising 3.0% prior quarter, and missing consensus of 2.1%. Separately, final sales to private domestic purchasers q/q rose 3.1% in 3Q after rising 4.3% prior quarter.